If artists hope to license their art to manufacturers, they need to create art that consumers want to see on products. Therefore, artists in the art licensing industry cannot just create any type of subject matter and expect to be able to license it for any type of product. The art licensing industry is very commercial. Artists that create art subjects that they love do not necessarily mean that it is licensable. Instead an experienced, and savvy licensed artist first researches what art manufacturers need to be able to sell their products AND THEN creates art that fits the manufacturers product line(s). Those are the artists that are successful in licensing their work. Of course, there are exceptions. For example, flower art is very popular and if the artist loves to paints flowers then of course it will be licensable IF the composition is well arranged and formatted correctly for the product. But, if the artist only paints roses then the possibility of licensing the art is limited because currently roses are not trending except for vintage art. Believe it or not, daisies and flowers that resemble daisies are currently the most popular for the majority of products. But there again, there are exceptions depending on the season or holiday. Poinsettias are popular for Christmas, tulips and other spring flowers for Easter, sunflowers for summer and autumn. That is why it is so important that artists learn what kind of art manufacturers license for their products before creating the art. Submitting art to manufacturers that they will not put on their products is a waste of time for the manufacturers and for the artist. As mentioned above, not all art is licensable or the art is limited in the type of products it will be licensed for. Your art may be beautiful and your family, friends, and even other artists may love it but unless it meets the needs of manufacturers selling to the mass or niche markets it may not be licensed. The following articles discuss more about licensable art and has suggestions on how to make your art licensable if you are struggling to get deals. – "Not all art is licensable" Make sure you read the comments because not everyone agreed with the title of the article when it was first posted in 2010. – "Is Your Art Good Enough to License?" 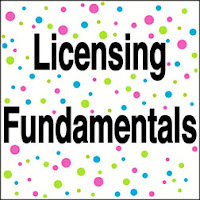 – "Creating Licensable Art: Composition Tips"
The size and shape of art that should be created for licensing consideration depends on the type of products that manufacturers produce. It varies between the different product industries and even between the different manufacturers in the same industry. Thus, there is not a standard size and shape used to create art for ALL products. 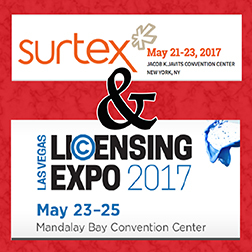 See below for more information about the size, shape, and format in creating art for licensing. As mentioned previously, art should be created for products. That means the shape of the art (vertical, horizontal, round, and square) depends on what type of product it is created for. 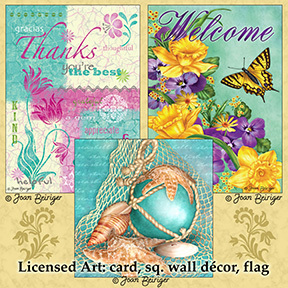 The basic shape for greeting cards, decorative flags, gift bags, and some wall art is vertical. Doormats & rugs, cutting boards, placemats, jigsaw puzzles, and some wall art are usually horizontal. Coasters, wall clocks, and dishes are usually round. Coasters, dishes, and wall art are sometimes square. And repeating patterns for fabric, gift-wrap, and scrapbooking is usually square or vertical. Although, product shapes depend upon individual manufacturers so it is important for artists to know what shape each manufacturer use on their products before creating and submitting art to them. For example, not all coaster manufacturers produce only square coasters so if you plan to submit coaster art to numerous coaster manufacturers it would be wise to format the coasters not only square but also round. Art should be created large enough so that the resolution will not be lost when placed on most products. For instance, if art is painted on a 5 by 7 inch sheet of paper (standard size for greeting cards) the resolution will NOT be good enough when enlarged for a 28 by 40 inch decorative flag. Each artist needs to figure out what size works best for the products they license or hope to license. Read "Art Licensing Tip: Creating the Correct Art Size" to find out more about the size of the art that should be created for products. Most artists scan their art or create their art in Adobe Photoshop at HiRes (high resolution) of 300dpi (dots per inch) because most manufacturers only need 300dpi. However, some manufacturers ask for 600dpi or even 1200dpi when the art is very detailed. The drawback in using a large dpi file is that if the file size is large it takes up a lot of computer space. Also the file takes a long time to transfer to the manufacturer over the Internet especially if the file is a layered Photoshop .psd file. Note: Many manufacturers asked for layered Photoshop .psd or .tiff files so they can adjust the size of the image. Some manufactures also ask that the image have a 0.5 or 1 inch or more bleed. A bleed means that the manufacturer wants the art to extend beyond the cutting edge so that no white area shows after trimming. For example, if the size of the final art will be 28 by 40 inches for a decorative flag, and the manufacturer asks for a one inch bleed, the artist would extend the art an additional one inch on each side and send the manufacturer a 30 by 42 inch image. When submitting art to manufacturers for licensing consideration, artists normally send LowRes files at 72dpi. Many artists send a LowRes 8-1/2 by 11-inch sell-sheet that has the image(s) and artist contact information on it. Also some artists use sell-sheets to submit a collection of art and product mock-ups illustrating what the art would look like on products. 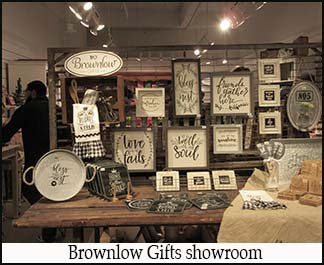 Manufacturers license art to help sell their products. They are always looking for new art that standout and are popular with consumers. New art does not always mean a new theme but maybe a new refreshed look of a popular theme such as snowmen, lighthouse, or flower gardens. Or, new could mean a new central image(s) in a popular theme such as a mermaid for a coastal theme and elves for a Christmas theme. Or, it could even be a new theme like woodland animals that was introduced several years ago and is still popular. 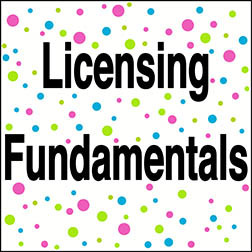 Successful licensed artists are continually looking at products to find manufacturers that license art and see what kind of art they license. 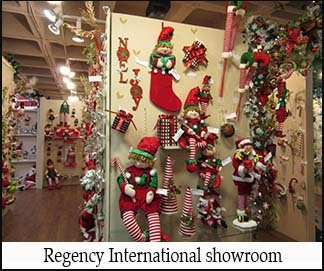 They visit all kinds of brick-and-mortar stores and manufacturer trade shows* that sell to retailers. Searching the Internet is an indispensable method in finding manufactures and checking out the art used on products. Note: Finding what art is used on products by looking at manufacturer websites is not always possible because many have their product section(s) and catalogues password protected for use only by retailers. However, by searching the Internet you can find retailer e-stores that show manufacturer products they purchased to sell to consumers. * Manufacturers exhibit their products at all kinds of trade shows. 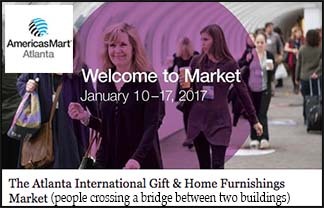 The most popular trade show that artists attend is the Atlanta International Gift & Home Furnishings Market held in January and July each year. The Atlanta show has a huge number of manufacturers that exhibit their products (both permanent showrooms and temporary booths) so it is the go-to-place for artists to view products that uses licensed art. 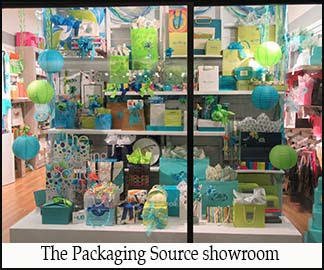 There are also many other trade shows besides gift shows that specialize in products such as apparel, outdoor equipment, hardware, textile, home and garden, kitchen and bath. 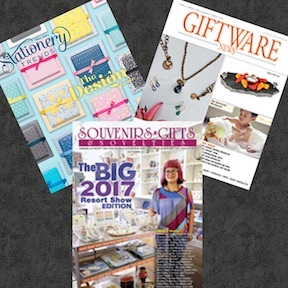 Most trade shows can be found in the "Wholesale Tradeshow Calendar". FYI: This tradeshow calendar is not up-to-date with all the show dates but it does list the trade show websites so that you can get accurate dates and location information. Note: Because the purpose of trade shows is for manufacturers to sell their products to retailers, they are normally closed to the public and difficult for artists to attend. 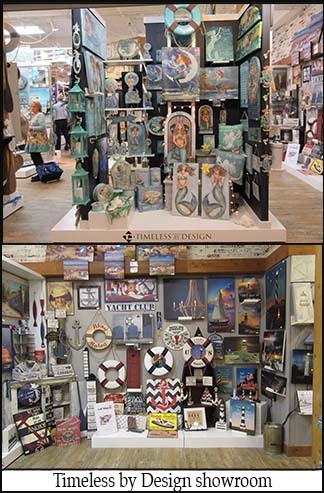 Read "Art Licensing: Why Walk Wholesale Trade Shows?" to find out more about trade shows and some ways that artists can attend them. – "Is There a Formula to Successfully License Art?" – "Art Licensing: The Importance in Knowing What Sells at Retail"
– "List of Manufacturers that License Art"
– "Art Licensing Editorial: Tips on Getting Deals"
– "List of Art Trends" The trends mentioned in this article are NOT up-to-date and you will probably see that some trends mentioned are not now seen on products. Because there are now thousands of extremely talented artists competing with each other, it is imperative that artists know what other artists they are competing against. Recognizing other artists work as similar to yours is important so that you do not waste your time in continuing to submit art to a manufacturer that is already licensing that artists work. For example, if the art style and themes are Americana and a manufacturer is already licensing art from one or more artists with an Americana look than they probably would not be interested in art from another artist with the same look. Some manufacturers use preferred artists when they have small product lines such as calendar manufacturers that only produce one or two calendars a year per theme (cats, dogs, birds, coastal, etc.). On the other hand manufacturers that have large product lines such as greeting card manufacturers prints hundreds of cards a year and they are always looking for art. Thus, artists have a better chance in getting a deal from them. Researching the art that the manufacturer has licensed to make sure your art is different but still fits their product line(s) will ultimately save you time and give you a better chance in licensing your art. Being a licensed artist has its pros and cons. Creating and licensing art for products is hard work. It is frustrating when you submit art and seem to wait forever to get a reply that you got a deal OR you never hear back. The more licensable art you create the better chance you have in licensing it but the reality is that most of the art you create will never be licensed. Theoretically art created for numerous types of products should be licensed for those products but in many cases the art may only be licensed for only one type of product. Now products have a shorter shelf life so monies earned from each licensing deal is lower than what was earned ten years ago. And, now more artists are licensing their art so the competition is stiff and each artist is getting fewer deals than before. Therefore, less artists are able to live only on the money earn from licensing their art. So why do artists continue to create art for products and try to license it if there are so many negatives? Every artist does it for different reasons. Some love to create and getting paid is a bonus to them. Some need to earn any money they can by licensing their art. Some love to see their art on products. Others enjoy the kudos from family, friends, and artists in creating wonderful art and getting deals. And some even enjoy the challenge in creating and licensing their art. Or they love it all! So whatever the reason, enjoy creating art to be licensed for products :) I wish you much success!!!! !